Sweet Jesus! I am not sure whom else to call on after experiencing this “Rock Star” of a coffee house. This is where Class, Simplicity and Rustic meet at the fork in the road. Walking into Commonwealth I knew I was in for a real treat and it was certainly not for it’s simple yet rustic decor! Not to worry, who needs fancy when you experience the unique “uncommon pleasures” that Commonwealth has to offer? The line was long (but moved quick), there was not a seat left in the house and the spirit was high! It was evident that folks where happy to be in this establishment. Commonwealth Coffee House offers what appears to be an incredible culinary experience. Using local ingredients and vendors raises the bar in what they are able to accomplish on their menu. It left me feeling like “Dang” “I wish I hadn’t eaten breakfast already!! For example, The Fried Egg Sandwich is made with guacamole, Pinconning cheese, and hot sauce on multigrain toast with a side salad! Sounds so good….right?! Also, a recent tweet says, “Have you tried our tea sandwich (with radish, cucumber, herbed goat cheese, pickled carrots & mustard greens) yet? Also there are a vast array of pastries such as, macaroons, muffins, sweet breads, brownies and cookies. My family and I tried the brownies and the chocolate chip cookies. Yummo!!!! Finally, the coffee bar was spectacular. 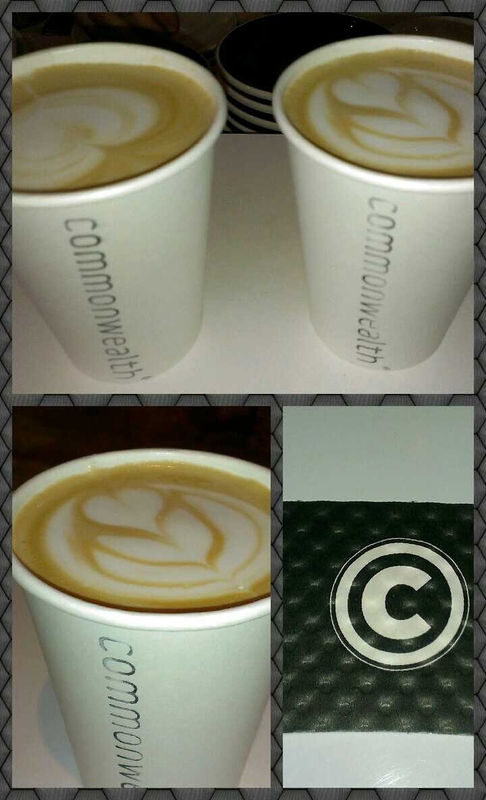 Commonwealth roasts single origin coffee beans in house, which is a great start in my book! The “pour over” station and espresso bar was an exciting and fascinating thing to watch. The Baristas where truly operating in their “element”. My husband and I had the © Latte. What is a © Latte…you ask? Well, it is a traditionally made latte with sweetened condensed milk. Need I say more? It was just PERFECT!!!! Whew! Listen, do yourselves a favor and check out this Coffee House! It is truly one of the best!! Categories: Uncategorized | Tags: Birmingham, breakfast, brunch, coffee, Commonwealth Coffee, espresso, latte, lunch, menu, Michigan, milk, rustic, tea | Permalink.